Jay-Be have a new range of folding beds and as Jay-Be stockists we've got the lot for you to buy at Harvest Moon. Jay-Be have been at the forefront of manufacturing folding beds for over 40 years and today offer the widest choice ever. 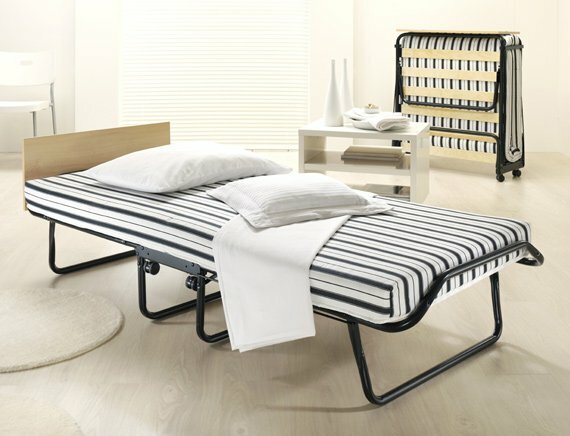 The image above shows the Jay-Be Jubilee folding bed. We also offer the complete range of Jay-Be fabric sofa beds. All Jay-Be furniture is made right here in the UK. Support British manufacturing by buying a JayBe sofa bed or folding guest bed from Harvest Moon today! We offer a quick 4 week 2 man FREE delivery to the room of your choice including assembly and removal of packaging to UK mainland addresses on all Jay-Be sofa bed orders at Harvest Moon. We also offer a rapid next day delivery available for the Jay-Be folding beds range please contact us for more details. All Jay-Be folding beds are UK made in Yorkshire and have a lifetime guarantee. All the Contract folding beds also have a lifetime guarantee and must legally meet higher standards than regular domestic beds. All Jay-Be guest beds labelled as suitable for Contract have been specifically designed to meet the additional legal requirements so they can be used within the contract environment. The current range of Jay-Be single bed folding bed models is as follows: The Jay-Be Value Airflow, Jay-Be Value Memory Foam, Jay-Be Advance Airflow Fibre, Jay-Be Jubilee Airflow Fibre, as shown below, Jay-Be Kingston Contract, Jay-Be Royal Pocket Sprung, Jay-Be Impression Memory Foam, Revolution Airflow Fibre, Revolution Pocket Sprung, Revolution Memory Foam, J-Bed Performance Airflow and J-Bed Memory Foam. The current range of Jay-Be 4ft double bed folding bed models is as follows: The Jay-Be Value Airflow, Jay-Be Value Memory Foam, Jay-Be Jubilee Airflow Fibre, Jay-Be Royal Pocket Sprung, Jay-Be Impression Memory Foam, J-Bed Performance Airflow and J-Bed Memory Foam. The image above shows the JayBe Jubilee folding bed. The Jubilee has a sturdy steel frame which is finished in a high quality, durable epoxy paint finish for a long lasting new look. 360° castors allow this guest bed to be manoeuvred easily, whilst the fully automatic folding legs open on their own so it is easy to put up in seconds. Simply unfold and let the automatic legs do the rest. See the short video below. (Approx 1 minute 5 seconds). There are also 3 more Jay-Be folding beds which are rated as Contract folding beds: Jay-Be Inspire Contract, Jay-Be Crown Premier and Jay-Be Crown Windermere. For full details including sizes and images of all the different Jay-Be folding beds please click here to go to the Jay-Be website. Simply choose what you want from their website and ask us for a price. All the Jay-Be videos are available on one page on the Jay-Be website here. Like the standard Jay-Be folding beds the Contract folding beds also have a lifetime guarantee but must legally meet higher standards than regular domestic beds. The Contract folding beds have been specially designed to meet the extra demands of contract use. From hospitals and care homes to hotels, b and b's and guest houses Jay-Be have a contract guest bed to suit any environment. Jay-Be contract folding beds successfully pass British, European and North American standards. Please click here to refer to the accreditations page on the Jay-Be website for further details on the standards achieved. The folding beds which are rated as Contract folding beds are as follow: There are also 3 more Jay-Be folding beds which are rated as Contract folding beds: Jay-Be Inspire Contract, Jay-Be Crown Premier and Jay-Be Crown Windermere. The image above shows the Jay-Be single Inspire Bed which is British made with a lifetime frame guarantee and has a J-Tex™ sprung base system for support and comfort, full width headboard in an Anthracite Oak effect finish, a Contract mattress and is suitable for regular use. It is is lightweight and rests on high quality 360° castors so you can manoeuvre and operate it easily. See the short video below of the Jay-Be Inspire Contract folding bed. (Approx 45 seconds). The Crown Premier Contract rated folding bed has a robust, heavy gauge, mild steel frames finished in durable epoxy paint. Folding out into a comfortable bed, the deep, spring interior mattress works in harmony with the J-Tex™ sprung base system to provide the ultimate in supportive comfort. The mattress is tailored in a high performance fabric and topped with wool comfort layers. Wool is a natural fibre that continually responds to changes in local humidity. Its natural ability to absorb and release moisture helps to keep you and your mattress dry and your body temperature constant, which is proven to enhance sleep quality. The third Contract rated bed is the Jay-Be Contract Windermere folding bed which has the same frame type as the Crown Premier bed. The mattress is topped with wool comfort layers to help keep your body temperature constant and is proven to enhance sleep quality. Tailored in a highly durable, breathable, antimicrobial, urea and water resistant mattress fabric, this guest bed is designed to cope with the most extreme contract environments. Perfect when comfort and durability is required. It is resistant to microbial growth including E-Coli and MRSA and is Hypo-allergenic forming an effective barrier against bed mites. 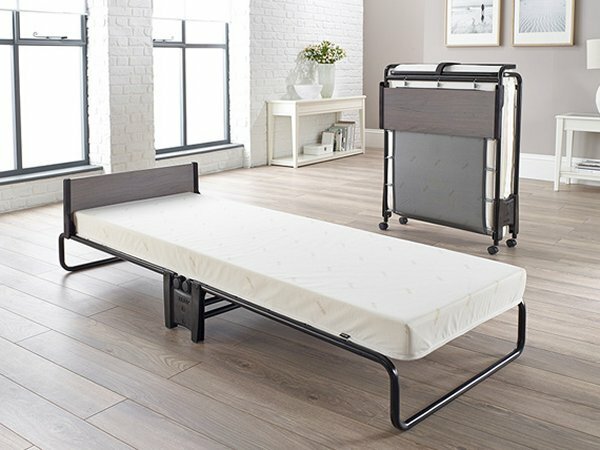 The Jay-Be Kingston folding bed also has a Contract rated mattress. For full details including sizes and images of all the different Jay-Be Contract folding beds please click here to go to the Jay-Be website. Simply choose what you want from their website and ask us for a price. All the Jay-Be videos are available on one page on the Jay-Be website here. At Harvest Moon we offer a rapid next day delivery available for all the folding beds including the Contract models please contact us for more details.